In my head I have the image of a young girl stamping her feet, refusing to accept the unacceptable, yet clearly irrefutable. The young girl is me, and the fact is that my therapist is not my mother. An ‘act of God’, an accident of birth, whatever you want to call it – the truth. I imagine the young girl taking those stamping feet with her to the first therapy session after the Christmas break – but I know that courage often forsakes her at the door. She is more likely to leave silence in her wake, a younger version inarticulate and unable to stay present. Or perhaps she will hand over to sarcasm and a calculated detachment – apparent cooperation over a thinly veiled resistance. The truth is unacceptable to all of them – they feel little or no control over the pain it causes. I should have known better – even as I was saying the words in my last session before the therapy break, I felt that it must surely be foolish to have such confidence, to make such bold assertions. “I don’t doubt my ability to stay connected”, I said. I have always thought that you are more vulnerable when you believe yourself immune, so why would I say such a thing? I suppose I did not think I was immune, so much as stronger, more ‘mature’ (in therapy terms). But still, it was a ridiculous thing to say. Particularly as I admitted to being fearful of the depression and difficult feelings that the Christmas break in particular, brings up for me. If I’d stopped to think I would have remembered that feelings of connection do not sit well alongside deep depression, and that ‘survival’ often means disconnection. But you never quite remember the nature of the darkness, until you’re trying to stay afloat in it again. There are some strange coincidences when it comes to the way in which mine and my therapist’s lives and histories, touch upon each other. Coincidences of place, or time, or music, or words. At the start of the break I attended an event which will be a part of our family’s life for some time, knowing that at one point in the past, it may well have been part of her family’s life too. Going to and from the event, I walked past and through places that had and still have significance for her family, that are part of their day to day lives. I wondered whether I would have been able to enjoy thinking of her and feeling connected by these places and events, if I were only thinking of her. As it is, the completely familiar but painfully recurrent wound of that unacceptable, irrefutable truth, was too present to allow the joy and connection to flourish or be felt. I changed the wallpaper on my phone to a picture of swans near my therapist’s house. Swans have been significant for us since a time, a year or so ago, when I left session feeling incredibly distressed, and felt drawn to drive to some nearby train tracks which had been part of my suicidal ideation in the past. 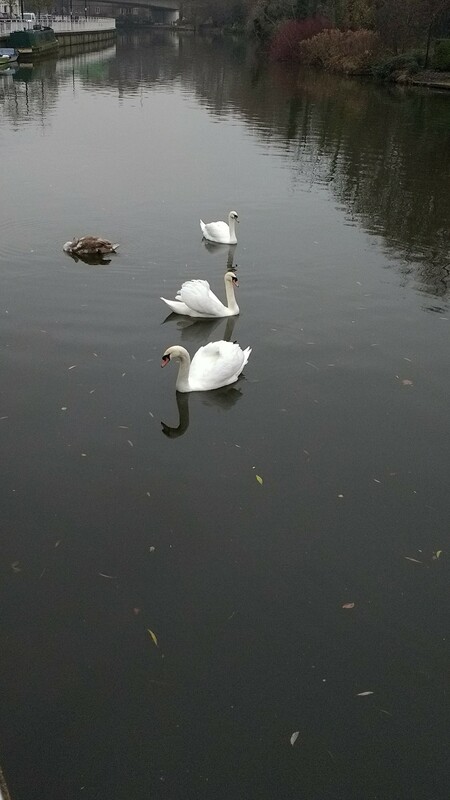 However, I happened to catch sight of the swans, and went over to take a photo. There were ten to twenty of them, and I stayed watching for a while, listening to the inchoate sounds they were making, which seemed to echo how I was feeling inside. I felt calm companionship, and after twenty minutes or so, I drove straight home. There were three beautiful white swans in the photo I put on my phone. I felt a little restless and uncomfortable because metaphor and imagery is important to me, and I wasn’t sure who the three swans represented. I should have preferred it if there were two, as the interpretation then, would be obvious – and comforting – enough. Could they represent the ‘Oedipal triangle’ of myself, my therapy-mother and a one-time therapy-father figure? The possibility that they might represent my therapist and her two daughters was not one I wanted to think about, so I pushed it to one side, trying to focus instead on the beauty and clarity of the image, even if there was no simple meaning that could be attached to it. It was a few days later, when, quite literally weak with exhaustion and pain from that ‘recurrent wound’, that I noticed another irrefutable truth, hiding (but only to my mind that refused to see it) in plain sight. The brown and white object on the water, to the left of the three beautiful white swans was not, as I had originally thought, a piece of rubbish floating on the water. It was a fourth swan, younger and so an ‘ugly duckling’ still, with its head and neck immersed in the river. The picture, all of a sudden, made perfect sense; the interpretation was clear. I knew my place in it, and that of my therapist and her daughters. The only mystery was why the picture took so long to reveal itself to me; but then, my ability to leave unobserved the readily observable, is one that I am all too familiar with. Suffering may seem too strong a word for such a thing, but I came to think of it as that. Daily, unremitting, suffering that I would have done anything to be able to cut out of me. Depression usually leaves my ability to sleep, intact – but not in this case. I couldn’t sleep because of the tears and because my mind was desperate to find an answer. I tried to examine the problem from every angle, proposing hypotheses and trying to imagine how I would feel in different situations. If my therapist had no children, would I feel this way? If she still had daughters, but had said we could keep in touch after the end of therapy, would I feel this way? Which was the most significant factor, eventual loss of the physical relationship, or the fact that I am not her daughter? But the two are inter-related and I was too distressed; and my hypothetical scenarios testing my hypotheses got me nowhere near discovering how to deal with the unacceptable and irrefutable truth. The wound and the questions were all-consuming – so much so that I didn’t know whether that meant that this was the one big issue I needed to deal with in therapy next, or that this was the one big stumbling block that would consume and stand in the way of my therapy and any future work. The thought that it might be the latter, was frightening. I had no idea how to get past this impasse; the wound had been recurring for years. But one thing I was convinced of was that the answer did not lie in my therapist’s usual encouragement to focus on what I do have, rather than on what I don’t. I know what I have, and I’m very, very grateful for it. But this wound won’t be healed by gratitude, and it won’t be covered over. It needs to be felt, and worked through, and dealt with – though I’m quite sure that at the moment, neither of us knows how. Suffering took me to a place in which I felt unafraid of death. All my life it has scared me – occasionally I’ve felt sheer existential terror in trying to imagine my own complete non-existence in a future stretching out for millions of years beyond me. We all imagine our death from our own vantage point – even when thinking of our own non-existence, the terror of the concept lies hidden from view because our consciousness is still in the picture – it is creating the picture. Skirting the edges (which is all we can do, given that we are conscious) of the true concept of a universe in which we are completely and utterly absent in every way – is one of the most terrifying things I have felt. And yet I felt – really felt – that I had made peace with the idea. That death would be a welcome release, despite the losses it would bring. I felt that the idea of non-existence did not scare me anymore – it was natural, it will come to us all. It had been a long time since I had had internal conversations with the various ‘parts of myself’, but as I lay in bed unable to sleep and wanting to die, the image of a child part of me, tugging on my sleeve, came into my mind. For the first time, she called me ‘mama’. I am aware that part of the process of therapy will involve learning to be my own ‘good enough mother’ to my internal parts, with my internal therapy mother there to guide me. Until now, I’ve had the sense that my various internal parts see me more as an older sister tasked with ‘mothering’ her siblings, and doing a rather ineffectual job, whereas they think of my internalised therapy-mother as their parent. And so to have my inner child call me ‘mama’, was a shock and a surprise. “Are we going to die?” she asked. “I don’t know”, I said, “do you want to?” . She paused, and then said “I think, if we are all together, then it is okay”. I looked over to a teenage part of me and she shook her head in assent, through her tears. Only the part of me I think of as ‘the flirty one’ (generally the ‘character’ where I locate myself as a ‘sexual being’) seemed to be unsure, and to feel anger and resistance. Perhaps that is unsurprising, given that she is the part of me most connected to my physical body. It was both a comforting and a dangerous image. I felt as though my inner parts were ‘giving me permission’ to die – that my internal pictures and conversations were leading to integration and resolution, and that that resolution was in harmony with the loss of my fear of death. I felt as though I was on a definite path; and though I was aware this felt comforting, at the same time, on a deeper level, the feeling was frightening. The next morning asI was driving along, I found myself planning, in my mind, the order of service for my funeral. For many years, I’d wanted to include the song ‘I hope you dance’ by Lee Ann Womack. Around a year ago I came across Caccini’s Ave Maria (the version for violin and orchestra) and I added that to the ‘playlist’, and more recently I decided on a choral piece as well. I wanted the service to be a progression, to form a creative whole that hung together and told a story. But how, I thought, can one progress from country music, to orchestral, to modern choral, in a way that was beautiful and coherent? It would take quite some creativity to pull that off – I hoped I was up to the task. Though it occurs to me now that playing ‘I hope you dance’ would be the height of irony, or perhaps hypocrisy, under the circumstances, containing as it does, the line ‘When you get the choice to sit it out or dance – I hope you dance’. By that afternoon, the suffering and the reconciliation to death had been replaced by anger, resentment, and envy. It felt as though the one internal part who had ‘broken ranks’, had decided to step in and protect. I felt both extremely vehement in my resentment, and simultaneously distant, constantly observing and interpreting my thoughts and reactions. I noted the increase in my self-hatred and what felt like hatred for others; the increase in self-destructive impulses; the temptation to less appropriate behaviours; the flirtatious or sexual edge to some of my online interactions. Although these felt like familiar ‘coping mechanisms’ from my past, I hadn’t previously associated this part of me with a protector who wanted to live, and who may have guarded against suicidality. And I had never previously put envy alongside sexuality (I am clearly lacking in my knowledge of the history and theory of psychotherapy and psychoanalysis!). Pictures and words from an imagined first session back, started to play over in my mind, constantly revisiting and building the anger and the envy. I imagined my first words to my therapist being “well that was an effing disaster”; I imagined her expression changing, defensiveness kicking in. I imagined my angry tirade. I imagined it over and over until I actually better understood some of the reasons why this feels like the worst therapy break in two years. Over the summer, my therapist and I agreed to stop emailing between sessions. This was followed shortly after by a major rupture, which it took me a long time to process, and one of the consequences was that adjusting to the cessation of email was much harder than it might otherwise have been. In order to adjust, I needed to feel absolutely secure in my attachment; but the rupture meant that I felt in constant need of reassurance that our relationship was still intact. Reassurance which I could no longer, of course, obtain by email. It was a vicious circle that was hard to break out of. In line with the cessation of email between sessions, this is my first therapy break with no contact with my therapist. A couple of weeks before the break, I happened to raise the subject of the end of therapy, and all of a sudden my pre-conceptions and fantasies about ‘post-therapy possibilities’ were shattered. Over the course of a very painful four or five sessions, it became clear that the ‘half-way house’ I had imagined, between actively being in therapy, and having a friendship, did not in fact exist. I had imagined a world of semi-regular email exchanges, of the kind we had had during therapy breaks in the past. Specifically, of the kind we had had during last year’s Christmas break during which I had managed to stay feeling connected and secure throughout, and we had exchanged a couple of lovely messages. I had imagined exchanges where I gave her updates on what was happening in my life, and she responded with encouragement, and occasionally with one or two details of her own life (such as a poem, book, or piece of music she thought I might find interesting or enjoyable). I knew that this would not be initiated by her, and I knew that she would still maintain a therapeutic ‘distance’ – but nevertheless I had imagined a genuine exchange, that would be enjoyable for both of us. It became clear that those fantasies were just that – fantasies. And so it seemed I had to face (though I still haven’t had the courage to truly face it) the unacceptable – that there would be no mutually enjoyable and genuine exchange, and that I might never hear from my therapist again, once therapy is over. This is my first break without email contact – having just found out there will be no email contact after the end of therapy. It is a break laden with associations and reminders of family – the family I am part of, and the family I long to be part of – just at the time when I have come face to face with the starkest, most chasm-like distinction between being a biological daughter and being a therapy daughter. At some point, the latter relationship continues to exist only internally, with few or no new physical reminders. Is it any wonder then, with all of that in mind, that I was consumed by envy of her and her family, and by anger (at her and at myself) for not realising just what a mammoth (and likely unrealistic) task I would be embarking on? So much, then, for my bold claim over my ability to stay connected during this break. I should have known better – though I still would not have thought I would ‘regress’ to this extent. Having said that, I know my therapist hasn’t abandoned me, and I know that she thinks of me and cares about me. It is not a perceived lack of those things, that fuels my anger and resentment. It is the not-yet-dealt-with, not-yet-processed, unacceptable and irrefutable truths that a no-contact break compounds by being its own stark illustration and reminder of those truths. I am not her daughter; I will never be her daughter. Of course I know the difference between a biological daughter and a therapy daughter – but it breaks my heart, now more than ever. I watched a film that turned a key, unlocked emotions, raised questions. Questions and emotions that made it feel as though I could choose love over envy and anger; that I could continue to self-actualise and bring my future to pass, by choosing to live through painful moments and accept them as un-sullying adjuncts to joyful moments. It felt a little like a religious experience, but then the next morning things felt flat. At least the envy and the anger are diluted now – there is more adult there, than there was before. But the strength of the connection I want to feel, I know I can feel, and that is there, eludes me. I want my therapist to wrap me in her arms when I see her – metaphorically, as I know she cannot, physically. And I need to talk about the suffering and try and figure out what it means, where it comes from, how to deal with it. I have to deal with it – it is still the dominant issue. I either feel it and am crushed by it, or I defend against it with emotions that block relationship and connection. Instead, I have to be able to tolerate it, and not just that – I have to be able to have positive experiences that are not utterly marred by it. Ideally, the irrefutable and unacceptable will eventually become acceptable, and cause me less pain. I need that – for my well-being and for some peace, as well as for the sake of my therapy. But in the meantime, I think I need that young girl to turn up to her first session after the break still stamping her feet, metaphorically, if not literally, and give expression to everything that’s bothering her. I think she has to say some things that are hard to hear – harder for her, than for her therapist. And she has to believe that they will both survive the experience intact. I hope I can do it. “I don’t doubt my ability to stay connected” is true, in this sense – I know that I don’t have to spend the first session back ‘testing the water’, rebuilding connection, checking things are still okay. I am confident they are. So perhaps I just have to use that as my anchor, and as the base from which to jump into new territory in my therapy. My therapist has often encouraged me to bring my ‘trickier parts’ into session – perhaps it’s time to try….. Categories: Therapy | Tags: #therapybreak, borderline personality disorder, BPD, Connection in therapy, envy and anger in therapy, feeling connected during a therapy break, feeling excluded from therapist's life, suicidal ideation, therapeutic relationship, therapist as mother, therapy, wanting to be part of therapist's family | Permalink. I am so sorry to hear you’ve struggled greatly over the break, but you possess such incredible insight in noticing your feelings, communicating with your various parts, and connecting the dots between the end of therapy realizations and the resentment of her family. There is a lot of success there, even amongst those very painful feelings. I hope that you will bring that young girl to therapy with you and discuss the tricker parts, that (you’re right) are so hard for us to hear aloud. Even if it doesn’t change the situation, it is such a brave thing to do. A parting thought: In reference to your picture with the swans, do remember while that the ugly duckling struggled fiercely in his life because he was not ‘one of the pack’, he later emerged as the most beautiful creature of all and took flight. Just a thought. I feel it too. My therapist initiated a 4 month break over the summer holidays to care for her mother. She has kept some clients. Just not the clients who demand more; like me. It has been so hard. I feel so lost and so abandoned.